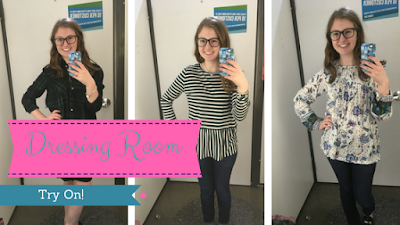 I am back with another dressing room try on! This is from Black Friday and everyone on Instagram (follow me @PinkEinstein) said they still wanted to see this post, so sorry it's going up so late. So if you're new, when I go shopping I take pictures of everything I try on and talk about what I liked or didn't like about the item. I do not buy everything that is featured but this time I did buy most of it because the whole Old Navy store was 50% off! I will try to link the items in case you want to shop them if they are still in stock. Here's what I wore to the store. My sweater is from the girls section at Target, a solid pink shirt underneath, Old Navy jeans, and my black mules from Target (also featured in this post). This sweater was found in the clearance section for just a couple of dollars. I love it because it's sweater material but it's still super casual and it can be styled so many ways. I also found this in the clearance section for $7! It isn't something I would normally pick but I really like it. I think it will be perfect for spring and I can even style it with tall brown boots in the early fall. I couldn't find it on the Old Navy website but if you like it for the print I linked a dress in the same print. Yes, I bought more stripes. I like this shirt because it's short sleeve and I don't own a short sleeve striped shirt and I thought the detailing on the back was really cute! I found it on sale in the clearance section for $5! So we went shopping on Black Friday and I was only allowed to keep two things that we purchased to wear and the others had to be put back until Christmas and I haven't had Christmas at my dad's house yet so I can't remember if I bought this or not and I'm really hoping I did! I love the peplum hem on this top and the olive green stripes I think this would look really cute under a herringbone vest with a pair of tall brown boots. This sweater is currently on sale. I have wanted a navy sweater for the longest time but I wasn't sure where to find one. I love the classic cable knit look and I think it will be perfect for wearing with a button up underneath. For some reason I was really drawn to this sweater even though it's purple, green, and yellow, my three least favorite colors. I ended up purchasing this one and my favorite way to wear it so far is with olive green jeans, cabin socks, and duck boots. Sadly I couldn't find this on the Old Navy website but I bet that they still have them in stores. I featured this top in my glasses blog post and I wore the same outfit pictured above, dark jeans and my Target mules. I have a top that I bought when school started from Old Navy and it turned out to be one of my favorite tops and I loved the buffalo check print on the top so I had to get this one. Yes, more stripes. I don't really have much to say about this one but that I liked the dark colored stripes and I didn't already own this shirt so I had to buy it. I have been eyeing dresses like this from other places like KJP but I just can't bring myself to drop that kind of money on a dress. It isn't exactly what I was looking for but I think it will be cute with tights and boots this winter. Sadly this dress is sold out. I saw this one and the other one and had to try them both on to see which one I liked better. I found this one on the clearance rack for $7 and I have a polka dotted version and I love it so I thought I should try a striped one. I have a shirt in this print (which I'm actually wearing as I'm writing this) which I love so why not get a dress in the same print. I think this dress is perfect for school days where you really don't want to wear pants but you want to look cute without putting in effort.